I don’t know about you, but working with someone that is an expert in their field is intimidating and can make me feel a little… well… not so smart. The unknown can be scary. Plus there’s that issue of: you don’t know what you don’t know, right?!? If I don’t know what I need, how do I go about hiring a graphic designer to help me with my new logo or website? How much does it cost to design a logo? Will it be worth it? You may be worried about hiring someone who doesn’t understand your vision, or perhaps you’ve had a bad experience with a designer in the past and you’re scared to invest your hard earned dollars again. I want to help alleviate those fears! 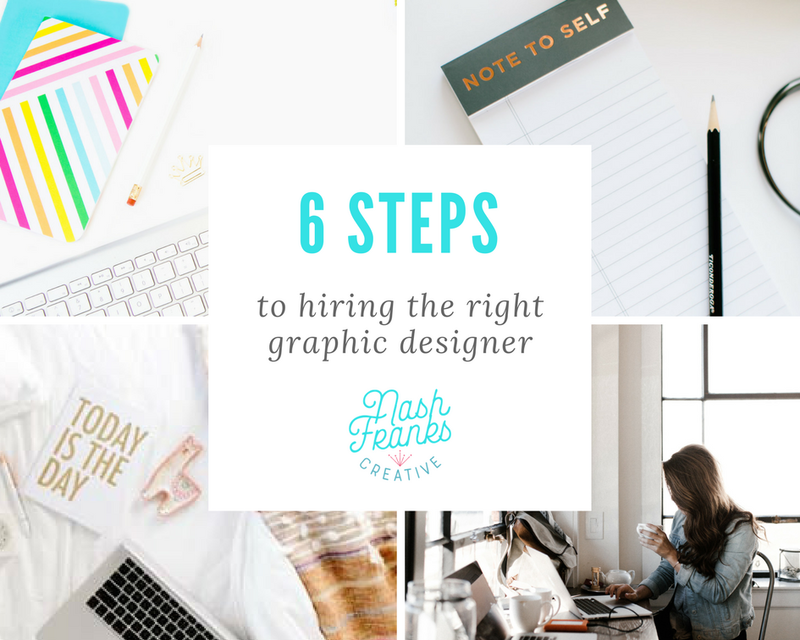 I’m going to walk you through the process of hiring a designer and give you some tips that will help make your working relationship go more smoothly. Because I know you want a brand identity that you are proud to share, represents your business story and most importantly, attracts those dream customers! Many designers offer branding as well as web design, but some focus only on one area or the other. Either way the basic process of what to look for when hiring a graphic designer or a web designer is the same. 1. What deliverables do you want/need? Do you need branding/logo, website, social media graphics, photos, supporting graphics, posters, brochures...etc.? Do you need branding strategy? Help with nailing down your mission/purpose/why? If you are just starting your business and not exactly sure what you need, many designers will offer a package that includes some basic social media graphics in addition to their branding and logo packages. Also, don’t worry if you are working with the designer and you realize you need something else, as long as you add it to the scope of work the designer will usually be able to accomodate additions for an additional fee. If you think you’ll need continual support from a designer be sure to mention that as well because some designers may not offer retainer services, but can refer you to a designer that does. Don’t be afraid to ask for referrals. Investigate brands you love and see who designed their logo or website and then go look at that designer’s portfolio. Want to work with someone local? Look beyond Google and search Facebook, Pinterest and Instagram. Search hashtags for someone in your area on Instagram, like for instance I live in Montgomery AL, so I might search #montgomerydesigner or #alabamagraphicdesign. I could also search for other nearby cities/towns. Another place to search and get referrals is in Facebook Groups. Word of caution about asking in FB groups: be very specific in your request because if you’re in a really big group you may get an overwhelming response. I’ve seen hundreds of responses to people looking for graphic designers or web designers and my guess is that you probably don’t want to weed through hundreds of suggestions. You may think that it’s all about the designer, but you really need to be honest with yourself and decide what is most important to you for this working relationship. Do you want someone who will hold your hand and give constant updates throughout the process or do you want someone to go off on their own and then deliver the goods? Are you super laid back and can’t handle people constantly hounding you for information? Or are you more structured? Are you super detail oriented or more big picture? You’ll can learn a lot about a designer just based on how they respond when you first reach out to them and the vibe of their proposal. How does this initial communication feel? Can you see yourself working with this designer? I know, I know… you’re not dating this person, but you are working on something together that is majorly important to you, so you’d better have some good chemistry. You’ll know from interacting with them if it’s there or not. I highly recommend that in the inquiry phase you have at least one phone call or video chat with them. Don’t do all the communication just via email. Do they seem excited about your project too? Or are they distracted and seem uninterested? Does their portfolio style match the style you’re looking for? If you feel like they get you and are in your head, you have chemistry and that’s going to make this working relationship go much smoother. Hiring a designer is definitely an investment. And many people understandably don’t feel that they can afford it in the beginning of their business. However, I will tell you that you can. If you are CLEAR on the foundation and the why of your brand then you are ready to invest in a designer to really bring your story to life. Because ultimately they are creating the consistency across your business with the branding that is going to help you bring in more customers. Now, I’m not saying that as soon as you plop that new logo on your site or front door that customers are going to flock on day one, but I am saying that by presenting a professional and consistent presence you will build trust among potential customers which will help to nudge them from being potential to actual customers. You shouldn’t judge a designer based just on price alone. What they offer in value of their services can easily be worth the higher price point. Different designers offer different deliverables, some that aren’t even tangible. Some blend business strategy with visual identities which can give you a more complete and well rounded brand identity. For instance, I work a lot with new businesses and I love to help them launch their new venture, as well as giving them some social media strategy guidance along with the designs I provide. It’s these un-written bits of communication and education that add value to what you are getting. Make sure you truly understand what each designer is giving you, what deliverables are you getting in the end? Just a logo? A logo and submark and colors and typography? I love to give potential new clients the contact info of some of my recent clients so that they can ask what it’s like to work with me. I find it really helps the potential client understand the value that I offer, beyond just my price tag. Don’t be afraid to ask a designer if you can talk to past clients. If they say no right off the bat, that might be a red flag that you aren’t a good match. Are you a good match? What is your gut telling you? Remember, both you and the designer will be trying to determine if you are a good fit during the initial emails and phone calls. This is why I HIGHLY recommend doing phone calls or even skype/facetime. You can learn so much more about a person when you can interact with them and see them vs just relying on emails. Go with your gut. Do you get the sense that the designer “gets” you and can deliver what you want? 99.9999% of the time your gut is right. What happens if you go through this process and the designer decides that your project isn’t a good fit for them? If they don’t provide recommendations of other designers right away, ask them to recommend another designer that they think might be a good fit for your project. Next in part 2 of The Ultimate Guide to Working with a Designer I'll discuss the design process. You'll learn the typical process of what it's like working with a designer on your logo or branding project. One of the biggest benefits of using Canva to design graphics for your brand, is that it’s FREE. While there are paid elements within the free account, you can basically make any type of graphic you want for web or for printing for free in Canva. There is also an app with Canva which means that you can create killer brand graphics on-the-go with your tablet or smart-phone. Another benefit of using Canva is that they have all of the most common sizes of web images and print images pre-loaded and you can be designing with a simple click instead of making sure you have everything the correct size. Of course, you can always create a custom size if Canva doesn’t have the exact size you’re looking for. If you don't already have a Canva account, go ahead and register now. Gather up all of your brand elements and images and upload them into your Canva account. Once you are logged into Canva, you’ll want to set up your brand elements. While the free version doesn’t allow you to upload custom fonts you can save your brand colors for use in your projects. You can create a brand style guide, if you don’t already have one, that will be saved in Canva. Having it saved in Canva will help you, or anyone else making graphics for your business, stay consistent with your branding when creating graphics. What you’ll need are your logo, any brand submarks you may have, the names of your fonts and the hex codes for your brand colors. 2. Load your brand colors. Add the hex code of up to 3 brand colors. The paid version, Canva for Work, allows more colors as well as uploading fonts and your logos. You can still upload logos in the free version, you just don’t have a folder labeled logos. 4. Now you can layout all of your brand elements on your style guide page. Typically you place your primary logo at the top and under that the alternate logos, submarks or any other brand elements. 5. On the left hand side click Text. We’re going to add you typography elements now. If your fonts are not in Canva, you can do a quick google search to see what other fonts are similar to yours and find those in Canva. If I know clients will be using something like Canva, I like to give them a font pairing that I know they will find there. Done! Now you have a style guide that will help you create killer brand graphics that are consistent with your brand story and message. Canva has preloaded size templates for all the most popular image sizes for online and for print. If you upgrade from the free plan to Canva for Work plan you get Magic Resize, which is pretty cool because once you create a design Canva will automatically resize it to whichever size you select. There is a little bit of adjusting you have to do after, but it’s keeps all of you elements to your graphic. This is a nice alternative to Photoshop or Illustrator. Honestly, I’m pretty darn good at Illustrator and sometimes I head to Canva to create graphics quickly. In fact, all of the graphics for this series on Facebook were created in Canva and I’m going to show you how to use a Canva template and make it your own. Once you’re logged into Canva click on the blue Create a design button. If it’s not an option already at the top right, scroll down until you see Social Media and select Facebook post. Scroll through the templates until you see one you like. Focus on layout, not color, not the image and not the font choice…. These are all things that you will change to match your branding. Once you make you selection you can click on uploads on the left column and grab a photo that you want to use from your uploads. If you click and hold the image and then drag it over where the image is on the template it should automatically replace the template image with the one you drug over. If you need to adjust the positioning, double click your image and drag or resize it as need to fit the cropping of the template. Next you’ll want to use your style guide (if you can’t remember your font names) and change the fonts out. Sometimes it’s easier to just insert a new text block in case the text spacing isn’t how you want it. Click the download button. For a web graphic you’ll want to use PNG and for a print graphic you’ll want a PDF. Come hang with the Nash Franks Family on Instagram!